The number of shares of no par value common stock outstanding as of August 12, 2015 was 200,000,000. 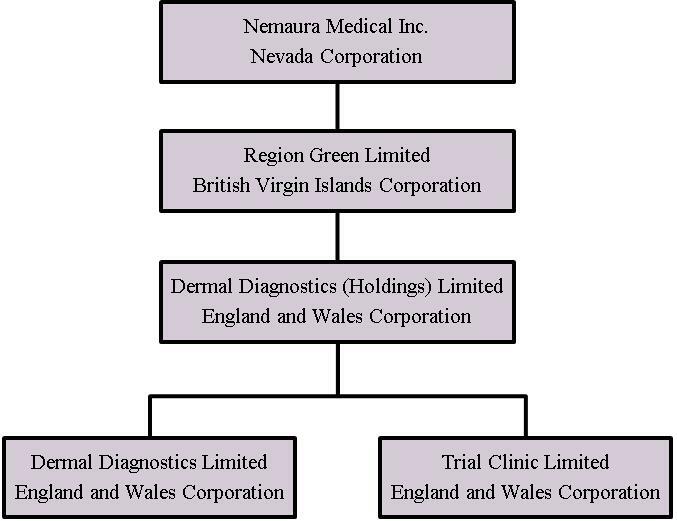 Nemaura Medical Inc. ("Nemaura" or the "Company"), through its operating subsidiaries, performs medical device research and manufacturing of a continuous glucose monitoring system ("CGM"), named 'sugarBEAT' The sugarBEAT device is a non-invasive, wireless device for use by persons with Type I and Type II diabetes, and may also be used to screen pre-diabetic patients. The sugarBEAT device extracts analytes, such as glucose, to the surface of the skin in a non-invasive manner to the surface of the skin where it is measured using unique sensors and interpreted using a unique algorithm. The accompanying financial statements of Nemaura have been prepared in accordance with the instructions to quarterly reports on Form 10-Q. In the opinion of management, all adjustments (which include only normal recurring adjustments) necessary to present fairly the financial position, results of operations and changes in financial position at June 30, 2015 and for all periods presented have been made. Certain information and footnote data necessary for fair presentation of financial position and results of operations in conformity with accounting principles generally accepted in the United States of America have been condensed or omitted. It is therefore suggested that these financial statements be read in conjunction with the summary of significant accounting policies and notes to financial statements included in the Company's Annual Report on Form 10-K for the Year Ended March 31, 2015. The results of operations for the period ended June 30, 2015 are not necessarily an indication of operating results for the full year. As reflected in the accompanying consolidated financial statements, the Company reported a net loss of approximately $403,000 and net cash used in operations of approximately $177,000 for the quarter ended June 30, 2015, an accumulated deficit of approximately $4,465,000, and a total deficit of approximately $1,332,000 at June 30, 2015. Nemaura Pharma Limited, a related company, has agreed to provide a loan facility should this be required to fund the company's operations through September 30, 2016. The Company believes that this loan facility in addition to the current working capital position, will be sufficient to meet its estimated cash needs for the remainder of 2015 and through September 2016. In March 2014, the Company entered into an Exclusive Marketing Rights Agreement with an unrelated third party that granted to the third party the exclusive right to market and promote the CGM and related patches under its own brand in the United Kingdom and the Republic of Ireland. The Company received a non-refundable, upfront cash payment of GBP 1,000,000 (approximately $1.555 million and $1.538 million as of June 30, 2015 and March 31, 2015 respectively), which is wholly non-refundable, upon signing the agreement. A supply cost for goods agreement will be finalized upon product approval and prior to launch, as part of the full commercial licensing agreement also to be signed closer to product approval and launch. Advances to Pharma as of June 30, 2015 consist of amounts advanced in connection with the Company's planned clinical trials. The remaining advances of approximately $70,000 are expected to be fully expensed in the second quarter of fiscal 2015 through the next stage of clinical trials. At June 30, 2015, the net balance due from Pharma is comprised of the remaining clinical trials advances of approximately $70,000, net of approximately $56,000 payable to Pharma. The Company has experienced recurring losses and negative cash flows from operations. At June 30, 2015, the Company had cash of $125,831, a working capital deficit of $13,525, stockholders' deficit of $1,331,625 and an accumulated deficit of $4,464,556. To date, the Company has funded its operations through the issuances of equity, UK government grants and contributions of services from related entities. The Company expects to continue to incur losses from operations for the near-term and these losses could be significant as product development, clinical and regulatory activities, consulting expenses and other product development related expenses are incurred. Nemaura Pharma Limited, a related company, has agreed to provide a loan facility should this be required to fund our operations through September 2016. The Company believes that this loan facility in addition to the current working capital position, will be sufficient to meet its estimated cash needs for the remainder of 2015 and through September 2016. In March 2014, we received an upfront non-refundable cash payment of GBP 1,000,000 (approximately $1.67 million) in connection with an Exclusive Marketing Rights Agreement with an unrelated third party that provides the third party the exclusive right to market and promote the CGM and related patch under its own brand in the United Kingdom and the Republic of Ireland. We have deferred this licensing revenue until we complete our continuing performance obligations, which include securing successful CE marking of the CGM patch. We expect to record the revenue in income over an approximately 10 year term from the date CE marking approval is obtained. Although the revenue is deferred at June 30, 2015, the cash payment became immediately available and has been used to fund our operations, including research and development costs associated with obtaining the CE marking approval. Research and development expenses were $264,279 and $162,486 for the three month periods ended June 30, 2015 and 2014, respectively. The increase was due to clinical trials commencing with patients based in India using the sugarBEAT device. In addition, to get the device ready for the clinical trials, work has taken place in house and using subcontractors. We expect research and development expenses to continue to be a significant cost in future periods as we continue our clinical studies of our sugarBEAT device and pursue our strategic opportunities. General and administrative expenses were $138,546 and $106,764 for the three month periods ended June 30, 2015 and 2014, respectively. General and administrative expenses increased by $31,782, primarily an increase in professional fees in order to pursue funding options. We expect general and administrative expenses to increase going forward in the long term, as we move our technologies forward toward commercialization and incur additional costs and expenses related to ongoing compliance with SEC reporting. For the periods ended June 30, 2015 and 2014, other comprehensive loss was $11,388 and $4,011 respectively, arising from foreign currency translation adjustments. We have experienced net losses and negative cash flows from operations since our inception. We have sustained cumulative losses of $4,464,556 through June 30, 2015 as technical development has continued. We have historically financed our operations through the issuances of equity, UK government grants, and contributions of services from related entities. Our cash position was $125,831 as of June 30, 2015. Nemaura Pharma Limited, a related company, has agreed to provide a loan facility should this be required to fund our operations through September 2016. The Company believes that this loan facility will be sufficient to meet its estimated cash needs for the remainder of 2015 and through September 2016. While our current cash level is sufficient for the commencement of the clinical studies and the initial scale up of our manufacturing, the completion of those milestones by the stated product development target dates is contingent upon our ability to raise additional funds. This may include a combination of debt, equity and licensing fees. If we are not successful in raising the funds needed in the specified timelines, the target dates for the achievement of the milestones will be extended. Net cash used by our operating activities for the three months ended June 30, 2015 was $176,806 which reflected our net loss of $402,826 together with an increase in accounts payable of $35,064 and a decrease in prepayments to a related party of $177,794. Net cash used in operating activities for the period ended June 30, 2014 was $766,212, which reflected our net loss of $269,250 together with a prepayment to related party for clinical trials of $561,132 plus an increase in accounts payable of $106,781. Net cash used in investing activities was $53,378 for the three months ended June 30, 2015, which primarily reflected expenditure on intellectual property. For the three months ended June 30, 2014, net cash used in investing activities was $10,828. There was no cash used or provided by in financing activities during the three months ended June 30, 2015. In connection with the preparation of our financial statements for the fiscal year ended March 31, 2015, we concluded there was a material weakness in the design and operating effectiveness of our internal control over financial reporting. We have begun to establish a number of remediation measures, which we believe will remediate the material weaknesses identified, if such measures are effectively implemented and maintained. As of the end of the period covered by this report, we continue the process of implementing and maintaining the remediation measures, but we cannot assure when or if we will be able to successfully implement these remedial measures.